Our friend and colleague Neil Hecht passed away on August 19th, 2015. This page will remain in place indefinitely, but the products listed here have been discontinued and are not available. TCXO driven secondary frequency reference for radio amateurs and electronics hobbyists. 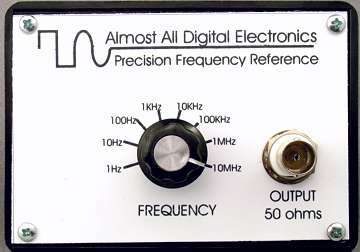 Inexpensive, accurate reference for radio amateur or electronic hobbyists. Ever wonder how accurate your frequency counter is? Or the frequency display on your receiver? Now you can find out quickly and inexpensively-- no workbench is complete without a frequency standard, and now everybody can afford one! The TCXO2 can be powered from a 9V battery or a +8-18VDC external power supply-- e.g. your 12V shack supply or an inexpensive wall-wart transformer. The power connector 9V "battery snap" accessible from outside the case. The output connector is a heavy-duty Amphenol BNC female jack for high stability. The circuit is very similar to that shown for the TCXO1 below, the major difference being the switch selection of output and the additional dividers to provide additional frequency outputs. Each TCXO2 is individually calibrated against a Rubidium frequency standard to about 0.1ppm (1Hz accuracy at 10MHz). Long term accuracy approximately 1ppm (1Hz accuracy at 1MHz). The 20MHz TCXO module drives a divide-by-2 network to produce the various reference frequencies. Output level is 0.5V p-p square wave into 50ohms. The TCXO itself is an SMD module which is individually calibrated against a Rubidium frequency standard .